Futaba proudly introduces the 14SG, the only 14-channel system with revolutionary 2.4GHz FASSTest technology. 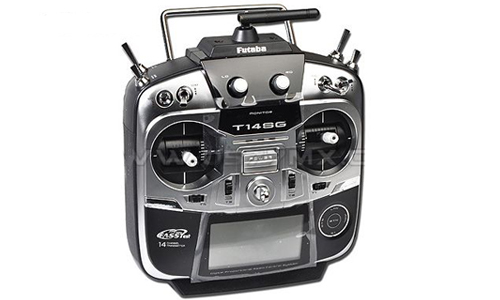 It's also compatible with Futaba FASST and S-FHSS protocols, so you can use virtually all Futaba 2.4GHz air receivers. The 14SG can also transmit and receive telemetry data. Install Futaba telemetry sensors (sold separately) to monitor flight data, receive alerts while in flight and more. Heli pilots will prefer the 14SG's flybarless gyro support �C which makes the 14SG the perfect system for flybarless flight.